To make things a little easier, I've ordered an IP cam so I can track the spawning from bed! Plus, I hope to be able to record the spawnings and watch them back to obtain more intel about the oyagoi and in particular, the performance of the males. Picked up the idea when I spoke with Mark Davis last and he mentioned he sometimes watches part of the spawning. When I considered what I learned last year when I watched the end of the females spawning after I put them in the males tank, and could see which males were more interested in spawning and which were more interested in eating eggs - a bit more intel on the oyagoi behavior in the spawning vats could be helpful. 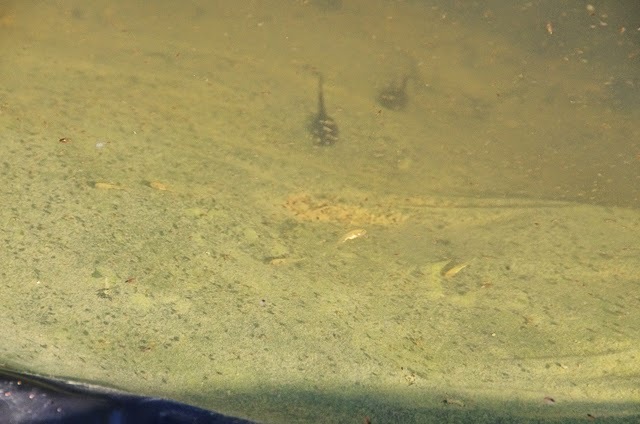 Took a few pictures around the edge of the fry pond outside, and you can see the kohaku fry are growing well, are present in good numbers and with plenty of natural food. There are lots or areas like this around the pond. 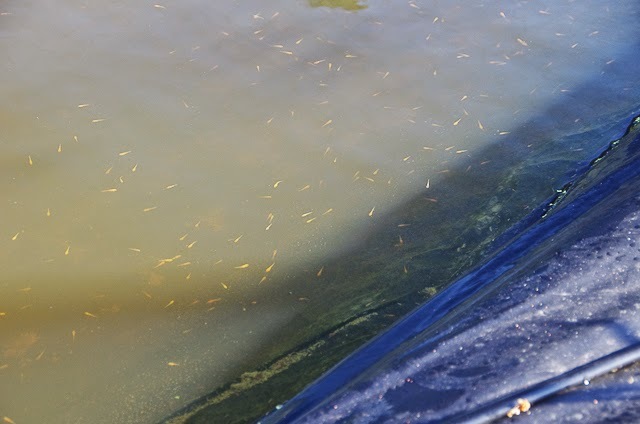 In contrast, last year you would see a shoal like this in one corner and perhaps at much lower density along one end of the pond - and I harvested 2500 kohakus when they looked like that. This time, we have kohaku fry around all the edges and thoughout the middle too - not always at this density, but they are still there. I'm struggling to estimate the numbers - but one thing's for sure, at the moment I'm heading for a significantly larger kohaku harvest than last year. Got in close with the camera to bring you this one, and you can also see some tad poles in there too. The black dots are shadows from daphnia and in the top right of the picture you can see little orange dots which are daphnia.